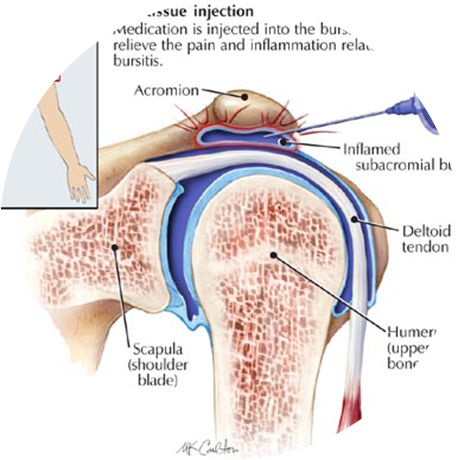 The judicious use of a small dose of corticosteroid with lidocaine directed at the specific site of local pain and inflammation can be very useful. It relieves pain quickly enabling physiotherapy and osteopathy to be continued unhampered (as in subacromial or subdeltoid bursitis). The risks of unwanted side effects are very low. Obviously it will be more effective if the part injected is rested for a week or two. It should not be given to allow someone to go out and compete tomorrow because of the temporary weakening of soft tissue structures such as tendons. It is never given into a tendon for this reason. Only frequent and high dose steroids risk causing systemic side effects. This is rarely required in musculoskeletal or sports medicine. Observance of these basic principles means that such injections can play an important part in the treatment and recovery process of many problems.